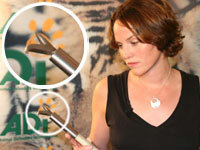 ADI Ambassador Jorja Fox (CSI’s Sarah Sidle) has released a new video for ADI, calling for an end to circus animal abuse. The 90-second video tells the story of Krissy, an elephant torn from the wild in Africa who ended up in an American circus. Here an ADI undercover investigator filmed Krissy being dragged to her knees with a bullhook before being kicked in the face by her Texas-based handler, Mike Swain, who continues to work with elephants, including Krissy. Krissy and her companion Queenie/Boo were also hit with a golf club and electric shocked with a stun gun, to make them move quickly to performances. The brutal scenes are juxtaposed with breathtaking images of a family of wild elephants living free in Zambia. Krissy is currently giving rides at fairs and other events. Click here to donate now to help us continue our undercover investigations, and the rescue, relocation and rehabilitation of abused and suffering animals. Click here to read about how Jorja Fox and Bob Barker joined ADI and the Performing Animal Welfare Society (PAWS) to launch the Traveling Exotic Animal Protection Act, H.R. 3359, the first-ever federal bid which aims to protect all wild and exotic animals forced to travel and perform in US circuses.